Well I haven’t done one of these for a while, it’s about time. I’ve been poking around Ravelry as you do and now I’m going to reveal my finds. Self-striping: Yarn with much longer colour runs, giving you stripes as you knit, with none of the effort. So much fun! Recently I bought a great example from Easyknits. So what can you do with this stuff that’s interesting? I have found several examples. They are roughly arranged in ascending order of complexity/mentalness. Let’s begin. With short colour runs, the occasional slipped stitch produces a very small break in the colour. A single slipped stitch may not be noticeable, but a repeated pattern produces a magic-eye effect quite nicely! Or you can really punch up a basic colourwork pattern with no extra effort. Nice! By biased lace patterns, I mean ones where the pairs of yarnovers and decreases that form lace are distinctly far apart, causing the fabric to pull in different directions. 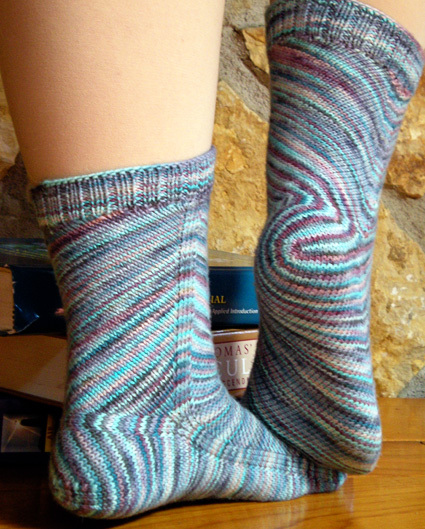 Works particularly well with self-striping, like in this version of Cookie A’s well-known sock pattern, Monkey. Getting a little crazier here…if you have a pattern with an unusual twist in the knitting, nothing will show it up like crazy sock yarn. Look at Skew. Q.E.D. Ok this is like, ninja-level knitting. Do you have the patience to measure colour runs? Do you like maths? Are you possibly operating on a higher plane of conciousness? 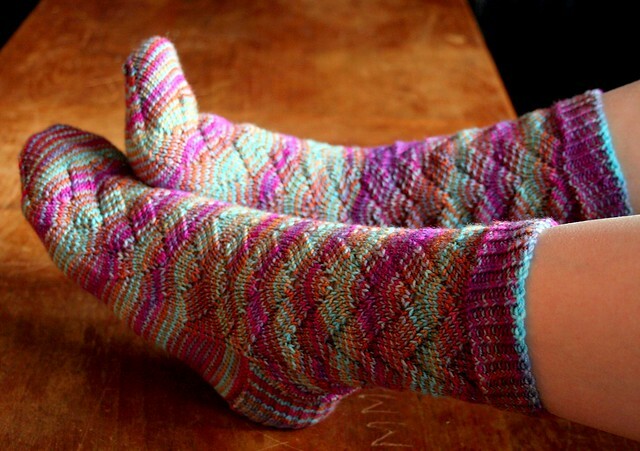 Then line up your crazy sock yarn and see what happens. That’s right, this was done with just a regular commercial hank of sock yarn. And magic. Love this roundup, thanks! I have a planned pooling project coming up. Can’t wait to play! Q – Have to admit that the thought of measure color runs gives me nightmares. I do love the items you have highlighted.